Total Workshop search results: 32. Displaying Page 1 of your woodworking search phrase CHILDREN BOOK SHELVES. Build a MCM style side table using the free plans at the link. It could also be used as a bookshelf for a childrens room or playroom. This wall mounted bookshelf is perfect for children to access their favorite toy or book. Just mount it low enough for them to reach. Free plan at link. Build a wall-mounted book rack using these step-by-step instructions. Link Type: free plans | Link Source: PrettyHandyGirl | Visit the category | Fix Link? Build a set of these adorable house frame bookshelves using these free step-by-step woodworking plans. These book ledges are easy to build and mount on the wall low enough for children to reach their favorite book. Link Type: free plans | Link Source: HoneyDoThis | Visit the category | Fix Link? Build these book holders and mount them on the wall to free up precious floor space in a kids room. Link Type: free plans | Link Source: AdventuresInCreating | Visit the category | Fix Link? Build these childrens bookshelves which do not take up too much valuable floor space. 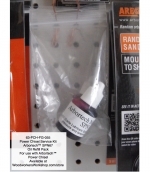 They should be attached to the wall with brackets for safety. Link Type: free plans | Link Source: LipstickAndSawdust | Visit the category | Fix Link? At the link you can download the free woodworking plans to build this childrens bookshelf. This childs bookcase allows the book covers to face out for easy access. Here are the free plans to build it. Build a pair of these fun cloud bookshelf ledges using this free tutorial. Link Type: free plans | Link Source: HowToNestForLess | Visit the category | Fix Link? This modular shelving system can be stacked in a number of different ways. With the backs painted each a different color, it creates a fun place for childrens storage. Build this fun childrens bookshelf using this free tutorial. Link Type: free plans | Link Source: TwoFeetFirst | Visit the category | Fix Link? Children will love this bookcase in the shape of a robot for their bedroom or playroom. Build it using these free plans. This childrens bookshelf was built using a single 8 foot 1×8 board. Follow along at the link and see how it was built. Link Type: free plans | Link Source: FixThisBuildThat | Visit the category | Fix Link? Why not build something a little different. 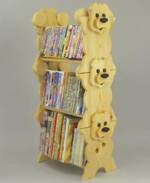 This polar bear bookshelf fits the bill. Here are the free plans. Get wood from your scrap pile and build a house book shelf for a childs bedroom. Perfect. Here is how to build it. Link Type: free plans | Link Source: SawdustGirl | Visit the category | Fix Link? Sawbuck projects! Cut it out from scrap wood you probably have in your workshop. Most plaque shapes can be made into slanted book shelfs, just like our whale of a tale book shelf. Beginner skill level. Book Stack Rack Woodworking Plan. Keeps your childrens story books, coloring books, CDs or DVDs organized. Each section stacks on top of another. You can make one, two or three sections (pictured) as your collection grows.